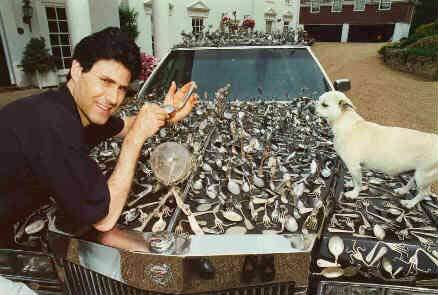 Uri Geller created the Geller Effect. 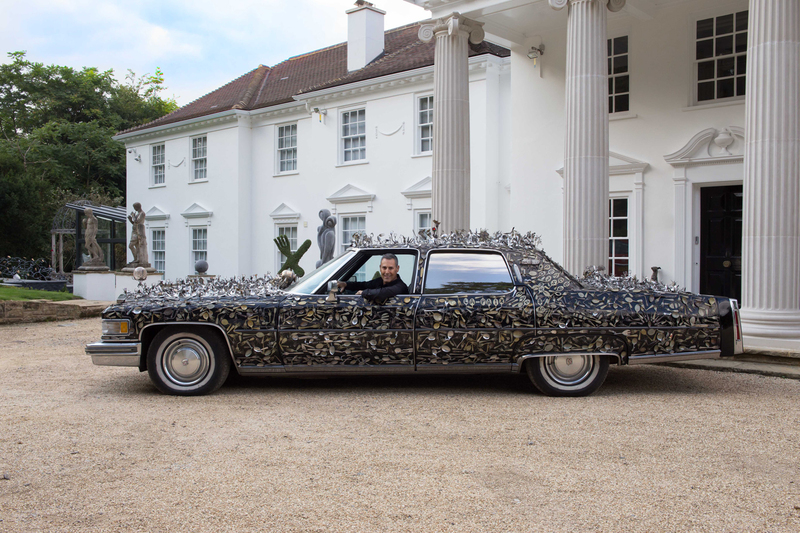 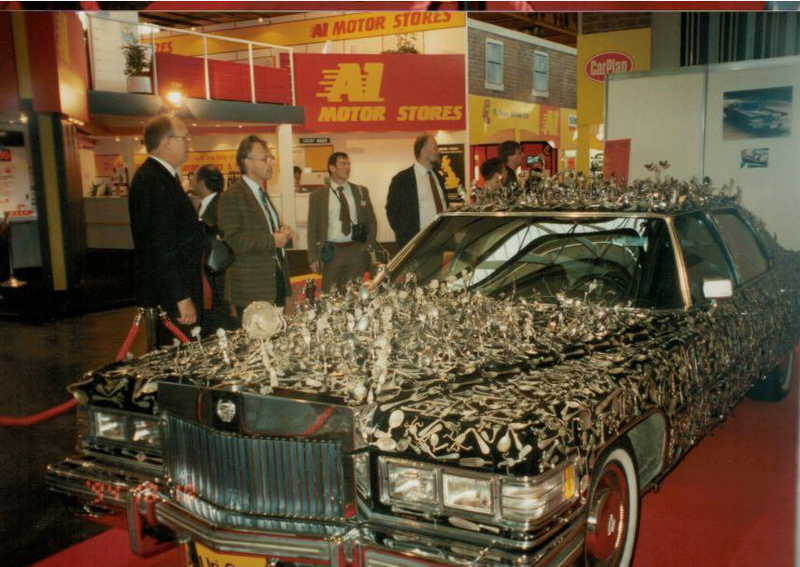 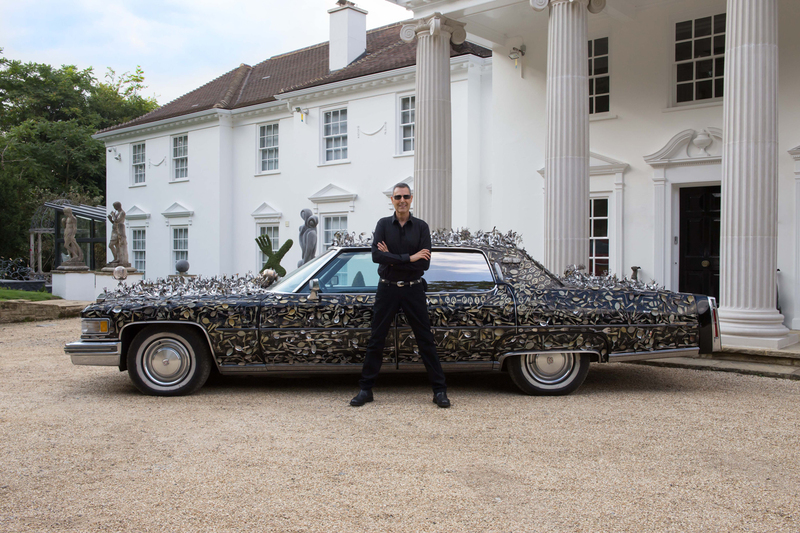 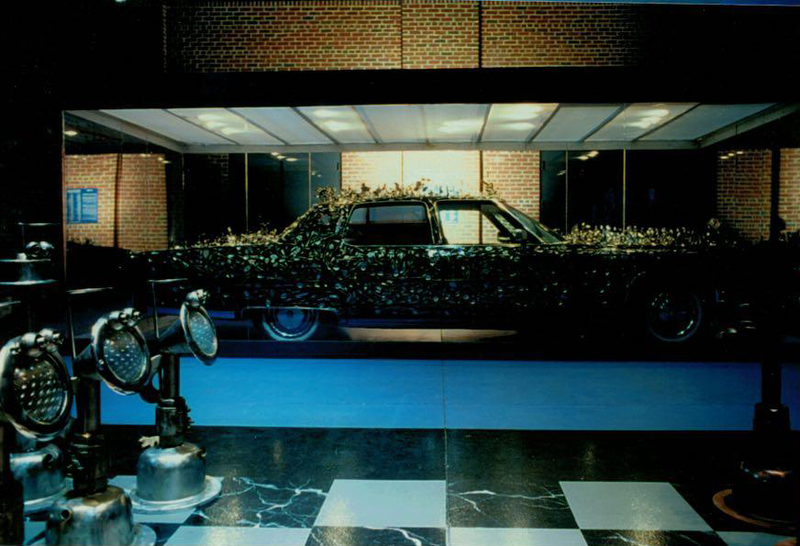 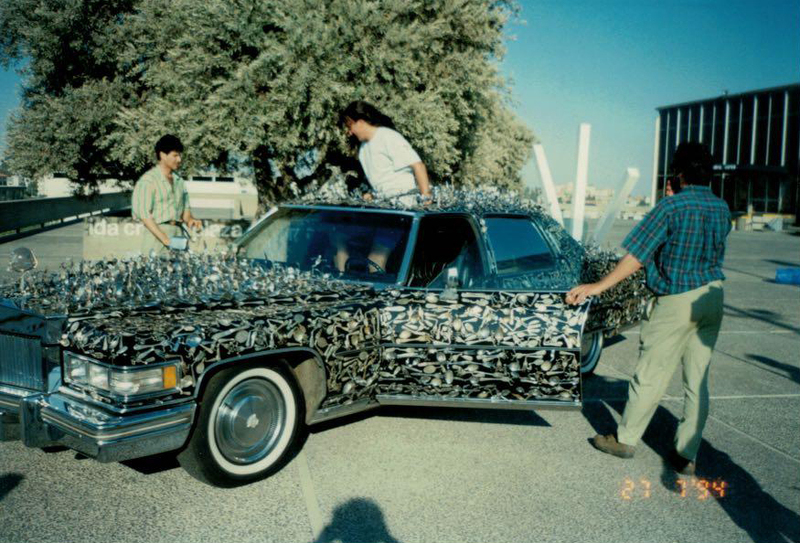 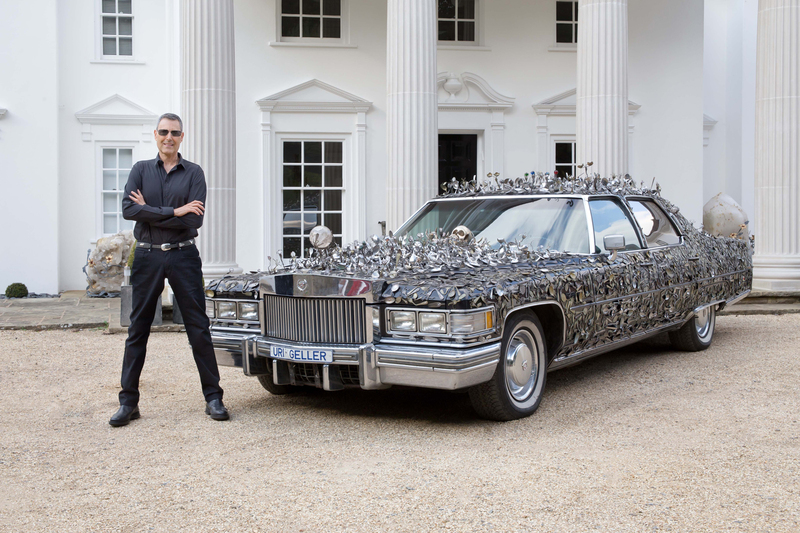 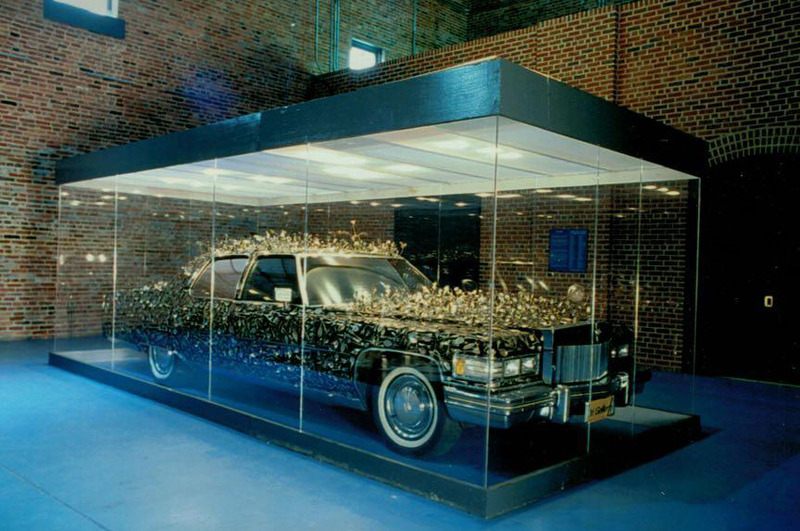 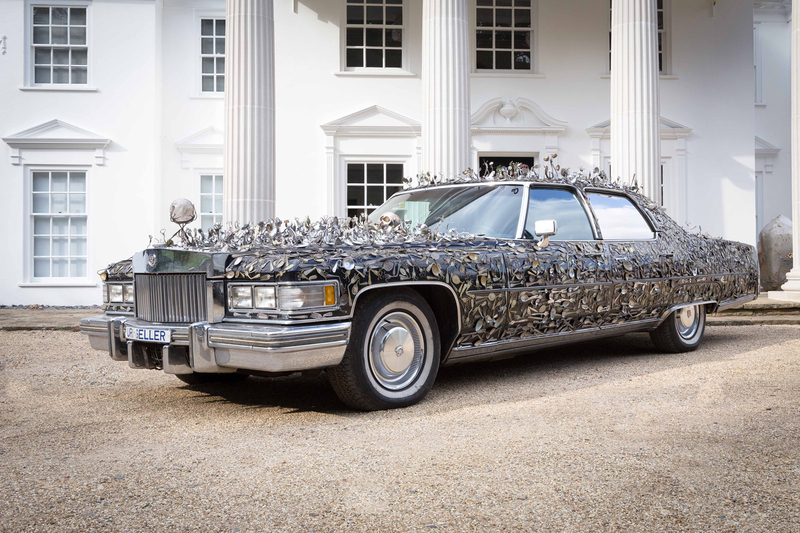 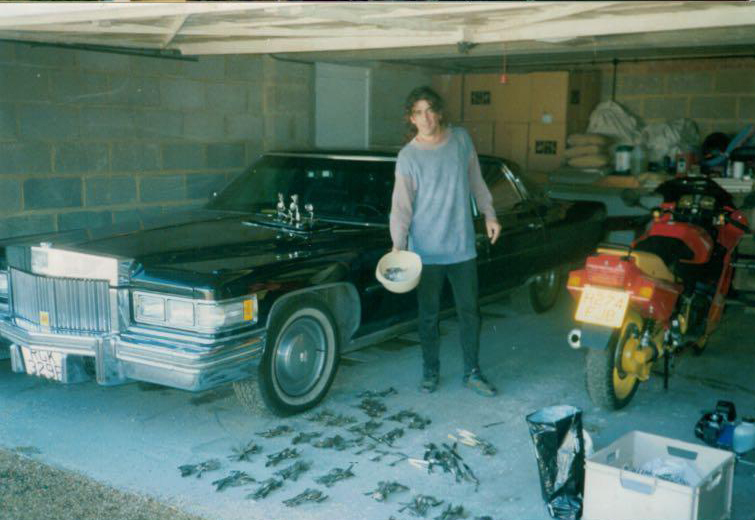 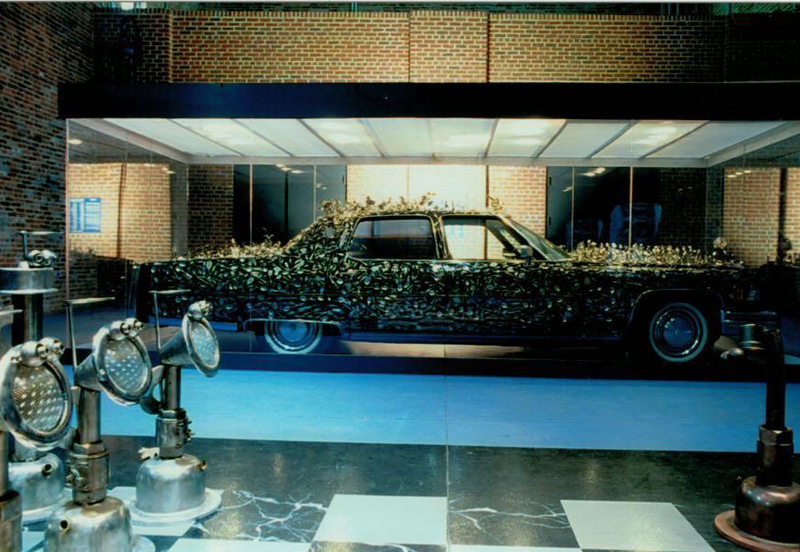 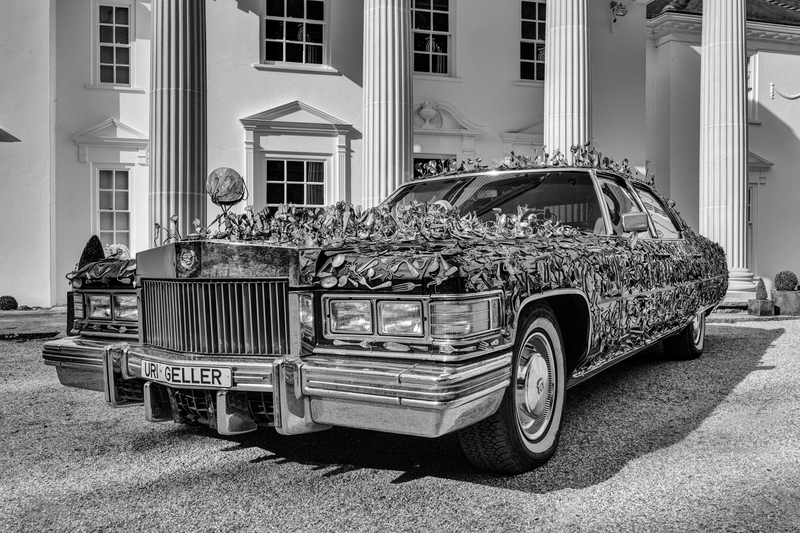 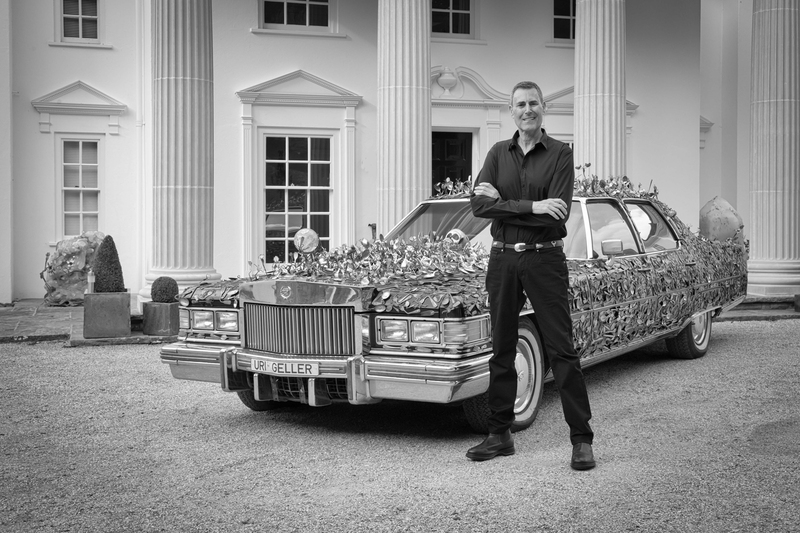 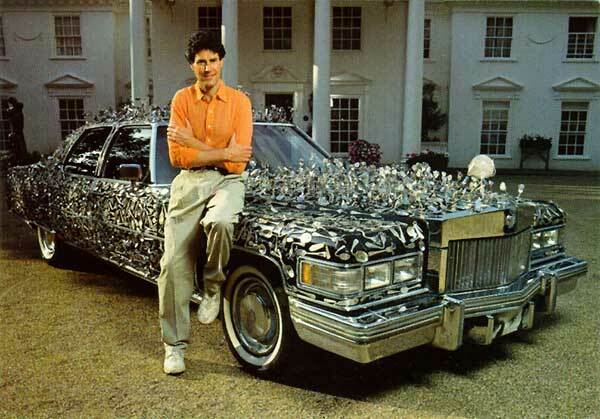 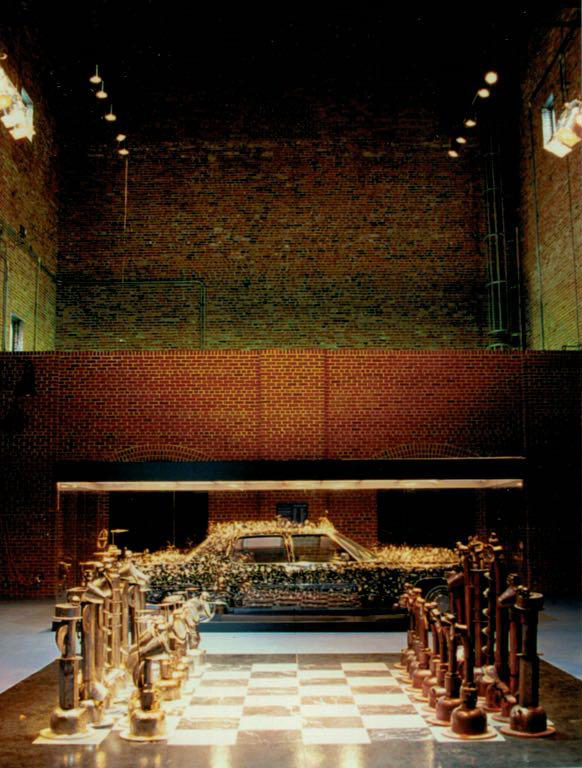 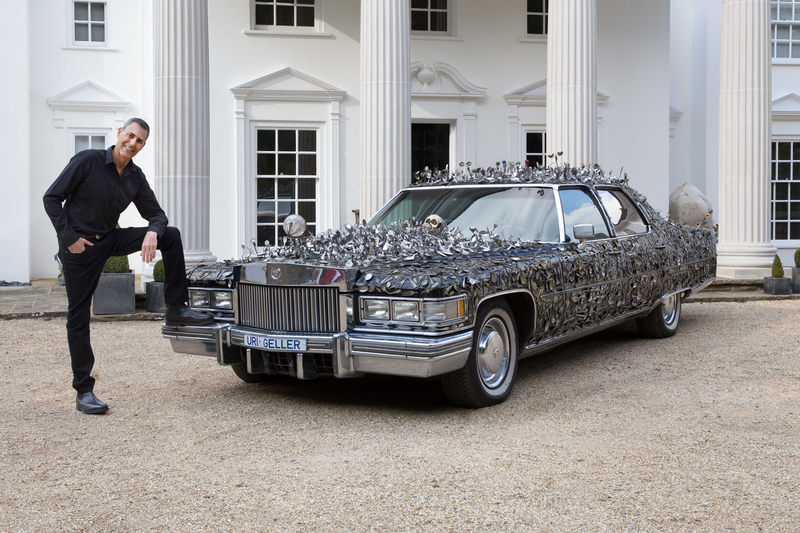 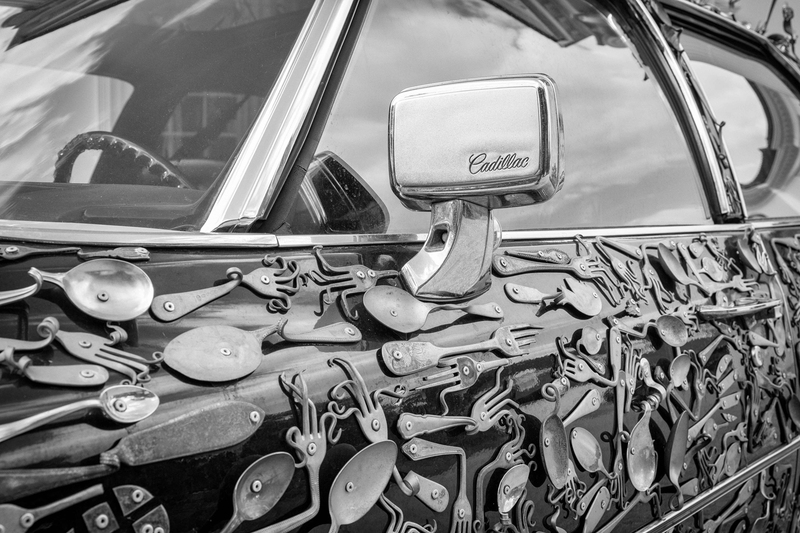 The car is his cherished custom-built 1976 Cadillac encrusted with approximately 2,000 pieces of contorted cutlery painstakingly riveted to the car’s body. 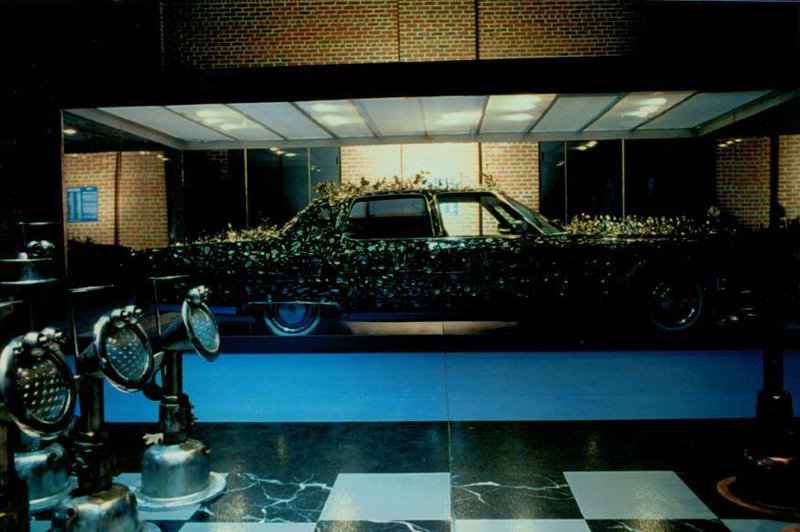 Some of his treasured pieces were owned, used or touched by famous personalities. 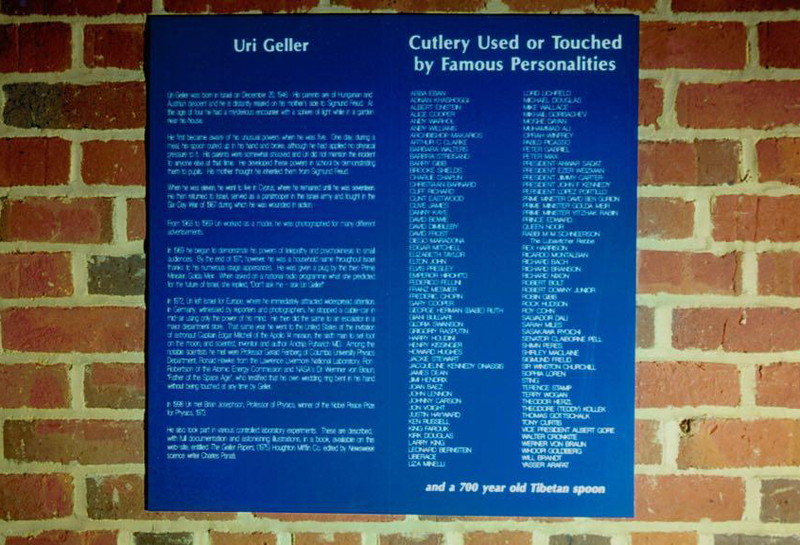 (See list below). 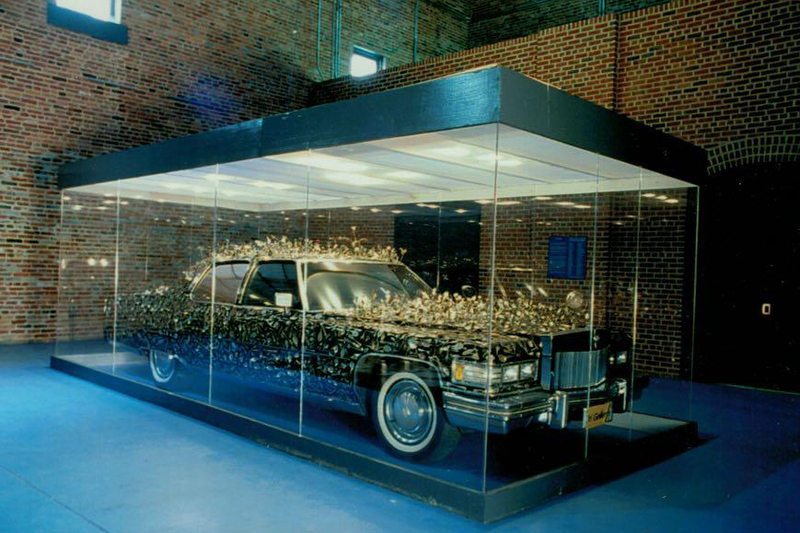 Many have semi-precious stones and crystals embedded in them in an artistic fashion. 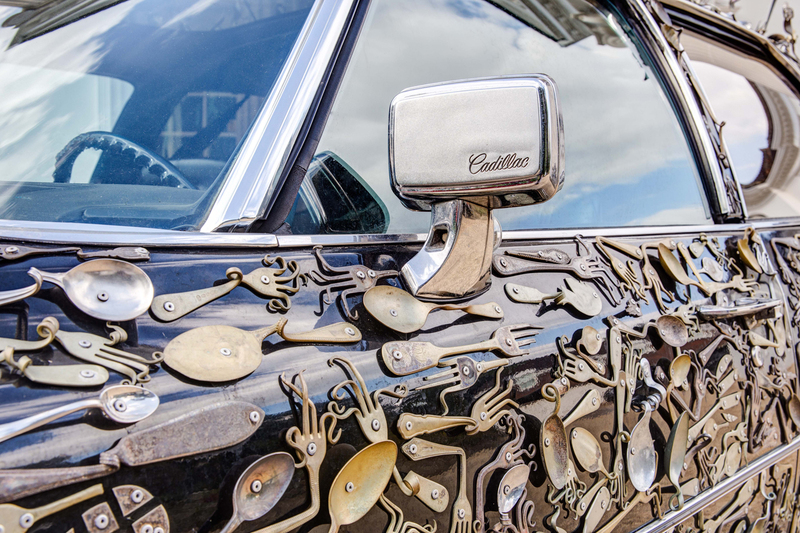 The bonnet’s mascot is a rare rock crystal globe once belonging to the surrealist master Salvador Dali. 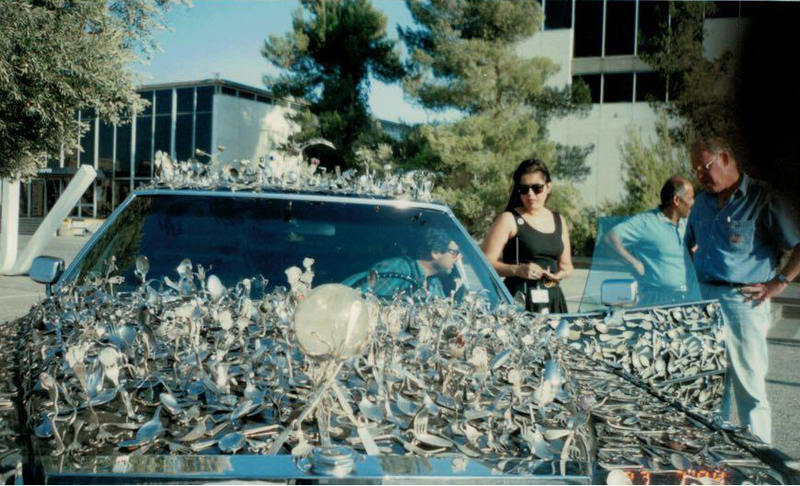 In addition looking closely it can be seen that some cutlery is carefully arranged to form the signs of the many religions and the symbol of peace adorns the car. 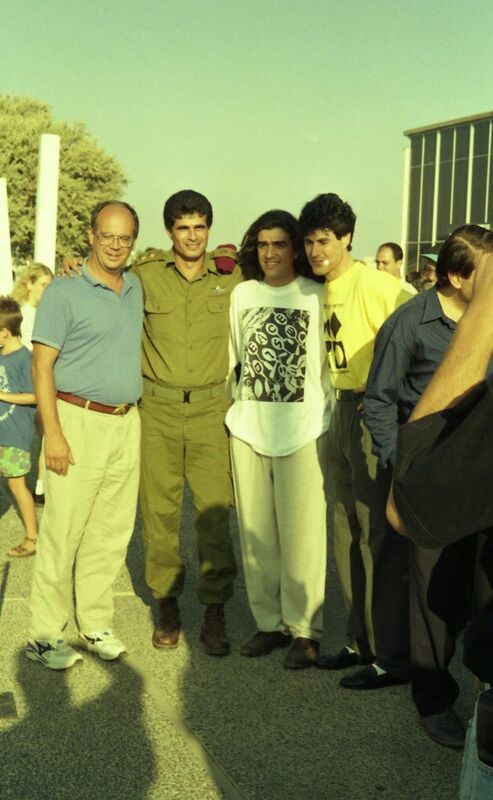 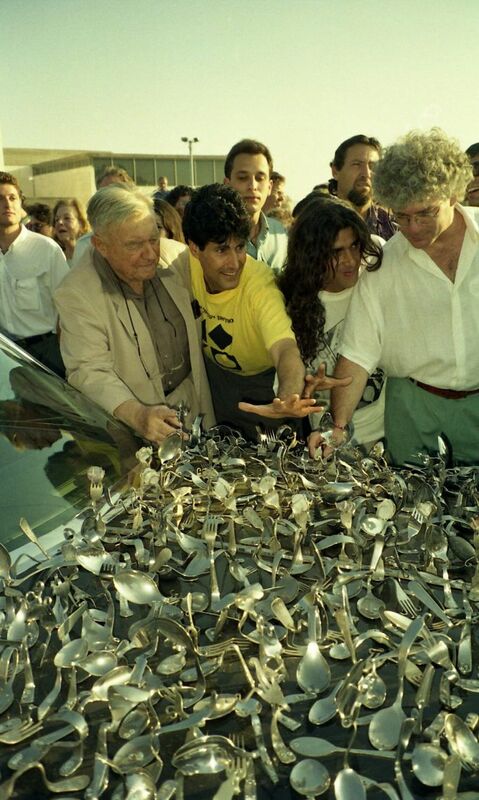 Uri Geller bent some of the cutlery, and the rest were artfully shaped by his Israeli friend, sculptor Avi Pines, who used physical technical means. 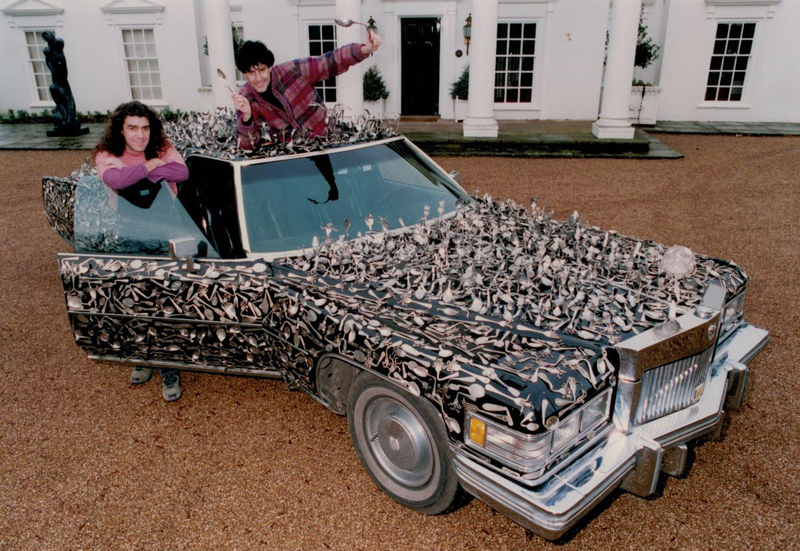 They spent over 6 months creating this masterpiece. 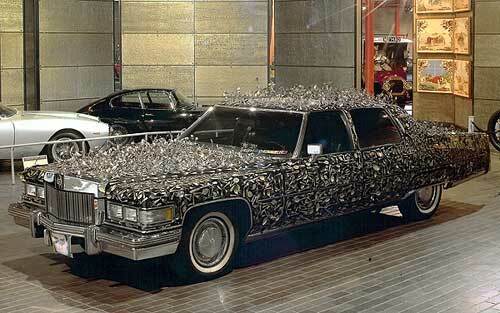 The ornaments adorning the car include several originals which Uri has salvaged from his 35 year metal bending career. 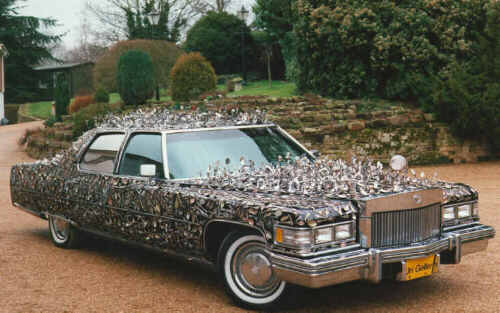 A number come from his personal celebrity collection. 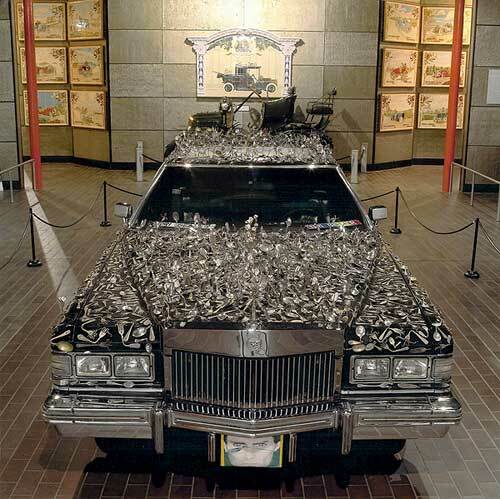 The word peace is incorporated into the design in several languages including Arabic and Hebrew. 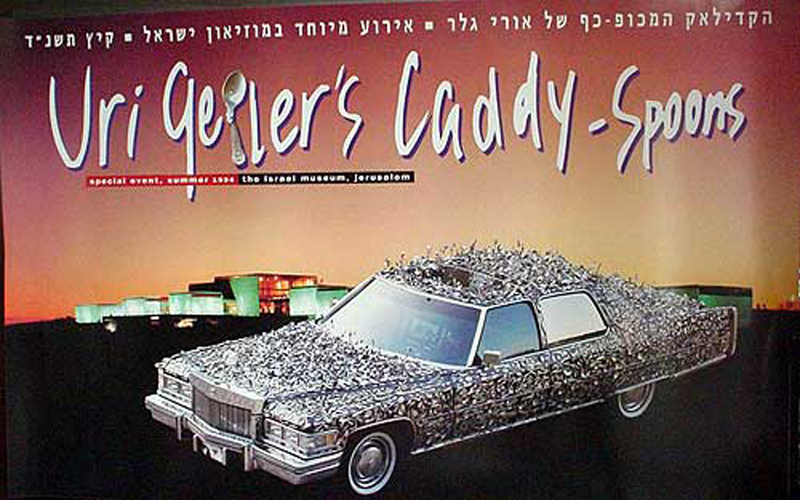 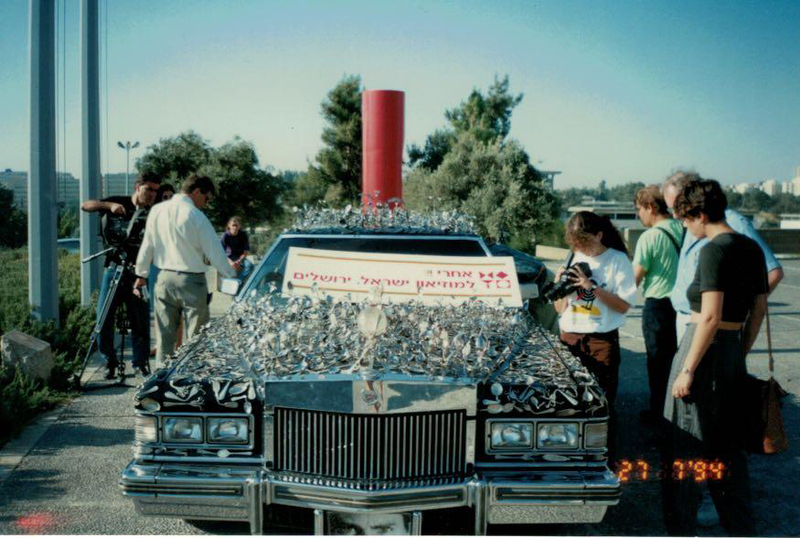 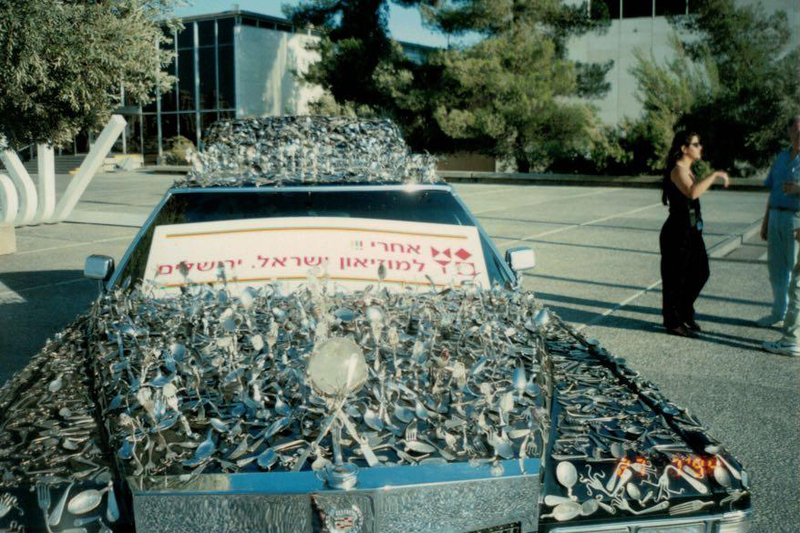 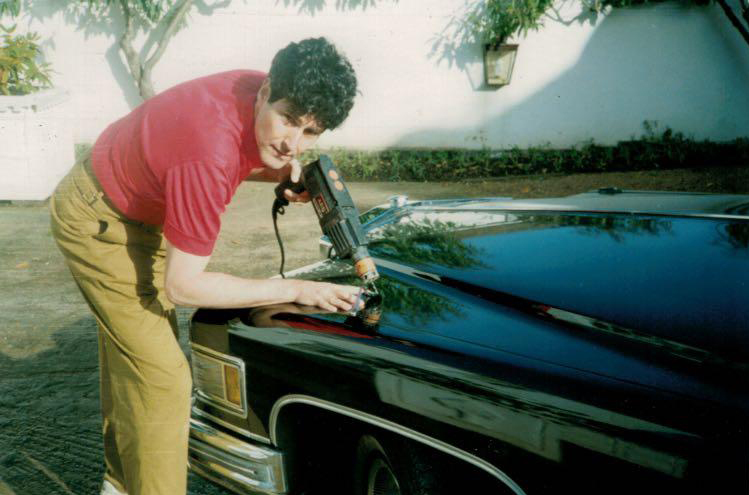 British, Israeli, Arabic and Indian school children donated around 1,000 of the spoons and forks, The priceless Cadillac has moved from the prestigious Israel Museum in Jerusalem to the American visionary arts museum in the United States, where it remained throughout the years 2000 and 2001. 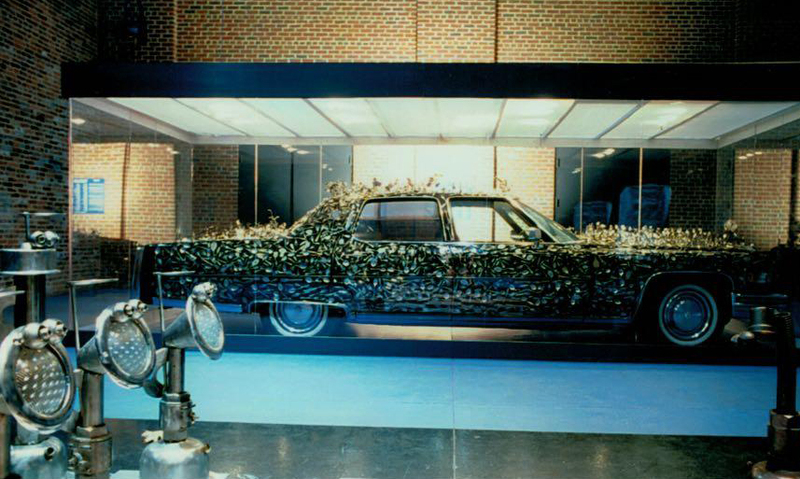 The car has also been displayed at the Jewish museum in London, and the Beaulieu National Museum in Great Britain. 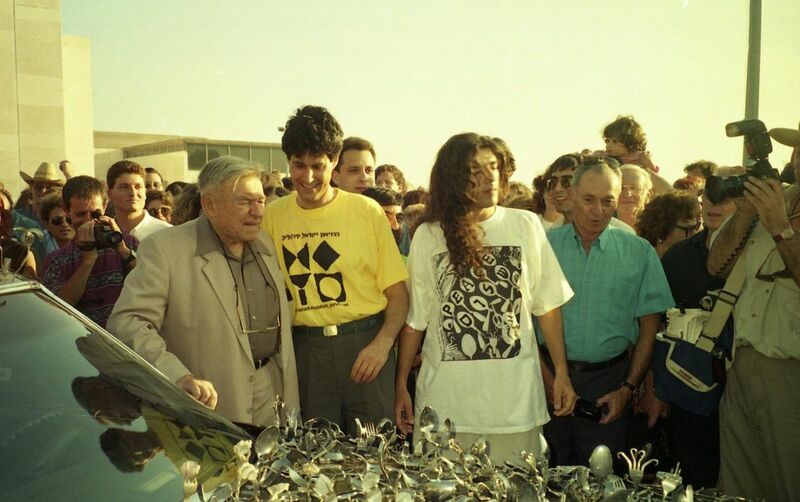 A ROMAN SPOON (dating back to the first century A.D.), ABBA EBAN, ADNAN KHASHOGGI, ALBERT EINSTEIN, ALICE COOPER, AMNON RUBINSTEIN, ANDY WARHOL, ANDY WILLIAMS, ANTONIO BANDERAS, ARCHBISHOP MAKARIOS, ARIK EINSTEIN, ARIK SHARON., ARTHUR C. CLARKE, BARBARA WALTERS, BARBRA STREISAND, BARRY GIBB, BASQUIAT, BERNIE ECCLESTONE, BILL MAHER, BILLY GILNAN, BORIS BECKER, BRIAN HARVEY, BRIDGITTE BARDOT, BRITNEY SPEARS, BROOKE SHIELDS, BUZZ ALDRIN, BYRON JANIS, CHARLIE CHAPLIN, CHRIS TUCKER, CHRISTIAAN BARNARD, CHRISTOPHER REEVE, CILLA BLACK, CLIFF RICHARD, CLINT EASTWOOD, CLIVE JAMES, CRISS ANGEL, DANNY KAYE, DAVID BLAINE, DAVID BOWIE, DAVID DIMBLEBY, DAVID FROST, DESTINY’S CHILD, DIEGO MARADONA, DON KING, DONALD TRUMP, EDGAR MITCHELL, EISENHOWER, ELEVEN SPOONS THAT BELONGED TO AND WERE USED BY KING GEORGE THE THIRD, ELIZABETH TAYLOR, ELTON JOHN, ELVIS PRESLEY, EMPEROR HIROHITO, FEDERICO FELLINI, FRANCIS FORD COPPOLA, FRANK SINATRA, FRANZ MESMER, FREDERIC CHOPIN, GARY COOPER, GEORGE HARRISON, GEORGE HERMAN (BABE) RUTH, GIANI BULGARI, GILLIAN ANDERSON, GLORIA ESTAPHAN, GLORIA SWANSON, GREEK HELLENISTIC SILVER SPOON (probably the earliest spoon that one is likely to discover), GRIGORIY RASPUTIN, HARRY HOUDINI, HENRY KISSINGER, HILLARY CLINTON , PRESIDENT DWIGHT D EISENHOWER, HOWARD HUGHES, HRH KING EDWARD VI, HRH KING FAROUK, HRH PRINCE EDWARD, HRH PRINCESS AND PRINCE MICHAEL OF KENT, HRH PRINCESS DIANA, HRH QUEEN NOOR, JACKIE STEWART, JACQUILINE KENNEDY ONASSIS, JAMES DEAN, JANE AUSTIN, JERRY SPRINGER, JIMI HENDRIX, JOAN BAEZ, JOHN LENNON, JOHNNY CARSON, JON VOIGHT, JUSTIN HAYWARD, KEN RUSSELL, KENNY ROGERS, KING OF GREAT BRITAIN AND IRELAND 1738 TO 1820. 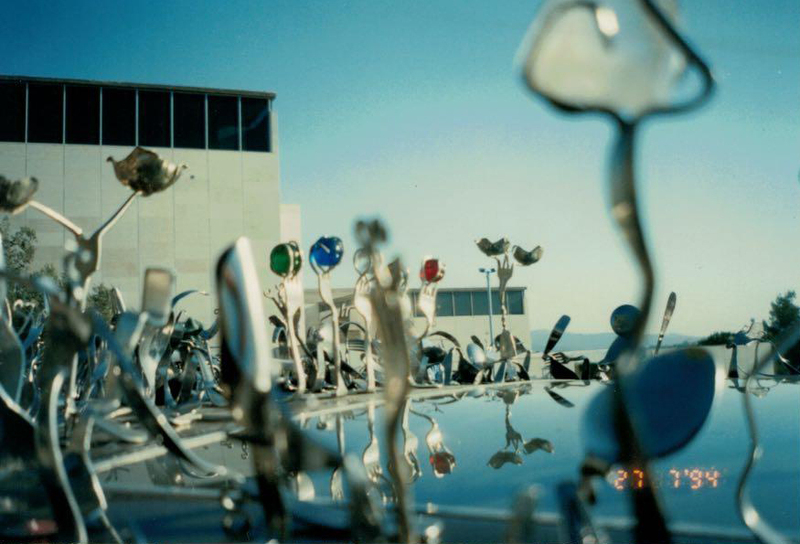 WHITE STAR LINE SPOON FROM R.M.S. 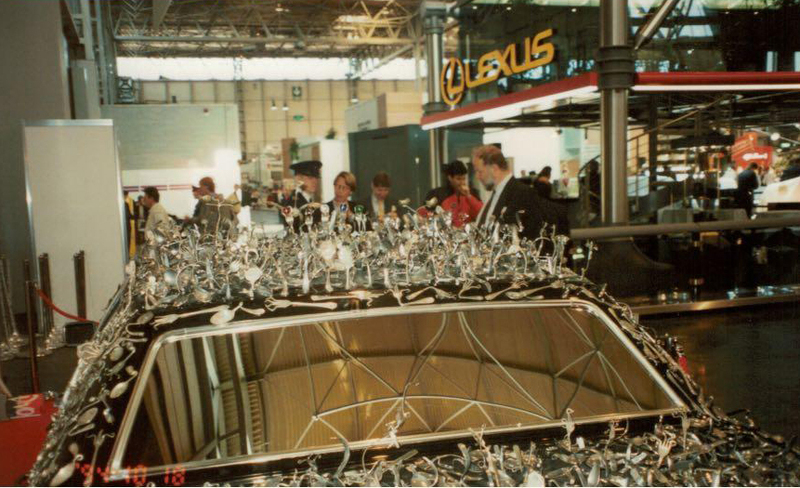 TITANIC SUNK ON THE NIGHT OF APRIL 14 1912. 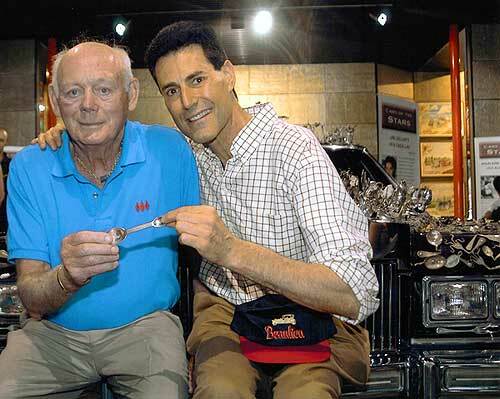 CUNARD LINE SPOON FROM R.M.S MAURETANIA USED ON MAIDEN VOYAGE 16th NOVEMBER 1907. 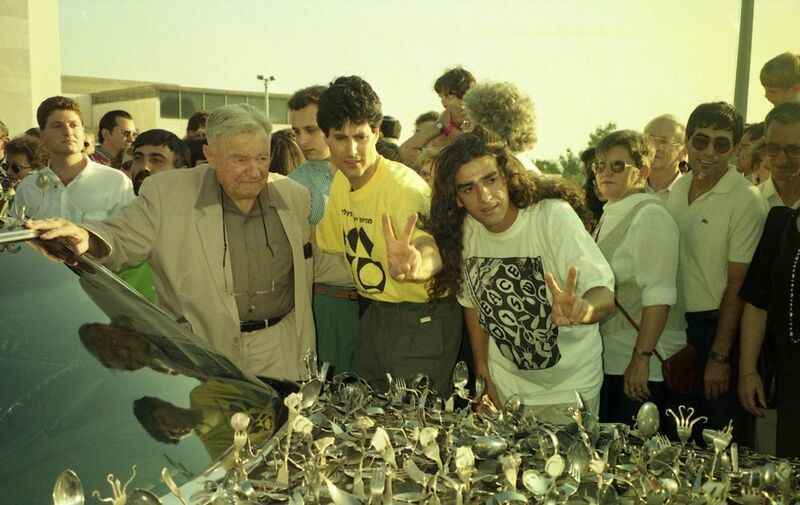 RUSSIAN SILVER COMMUNION SPOON IVAN ALEXEYEV MOSCOW 1894. 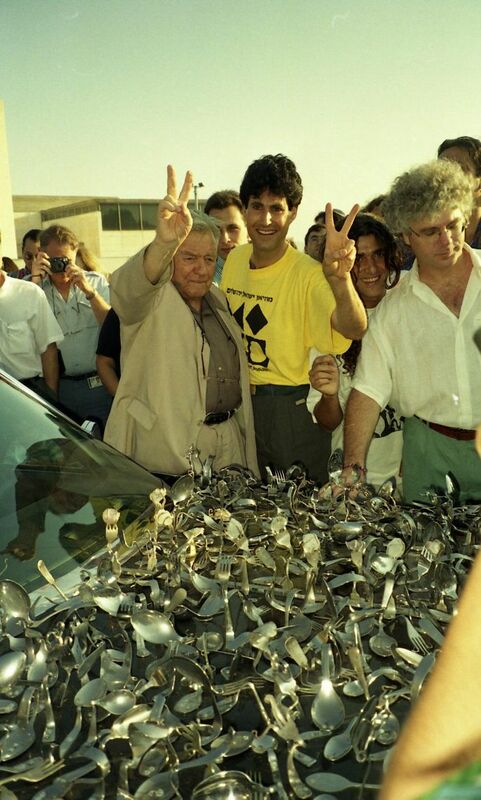 KING JAMES THE FIRST SEAL SPOON, KIRK DOUGLAS, LARRY KING, LENNOX LEWIS, LEONARD BERNSTEIN, LEONID BREZHNEV, LEWIS HAMILTON, LIAM GALLAGHER, LIBERACE, LIZA MINELLI, LORD LITCHFIELD, MARCH ANTHONY, MARLON BRANDO, MICHAEL DOUGLAS, MICHAEL JACKSON, MICK JAGGER, MIKE BRANT, MIKE TYSON, MIKE WALLACE, MIKHAIL GORBACHEV, MOHAMED AL FAYED, MOSHE DAYAN, MOTHER TERESA, MUHAMMAD ALI, N*SYNC, NATALIE IMBRUGLIA, NIKITA KHRUSHCHEV, OLE NYDAHL (LAMA OLE), OPRAH WINFREY, PABLO PICASSO, PETER GABRIEL, PETER MAX , PETULA, PETULA CLARK, POPE FRANCIS, PRESIDENT ANWAR SADAT, PRESIDENT BILL CLINTON, PRESIDENT EZER WEIZMAN, PRESIDENT HARRY TRUMAN, PRESIDENT JIMMY CARTER, PRESIDENT JOHN F KENNEDY, PRESIDENT LOPEZ PORTILLO, PRESIDENT RICHARD NIXON, PRESIDENT WOODROW WILSON, PRIME MINISTER BENAZIR BHUTTO, PRIME MINISTER BENJAMINE NETANYAHU, PRIME MINISTER DAVID BEN GURION, PRIME MINISTER DAVID CAMERON CHARLES AZNAVOUR, PRIME MINISTER EDWARD HEATH, PRIME MINISTER EHUD BARAK, PRIME MINISTER GOLDA MEIR, PRIME MINISTER MARGARET THATCHER, PRIME MINISTER SHIMON PERES, PRIME MINISTER SHINZO ABE, PRIME MINISTER TONY BLAIR, PRIME MINISTER YITZHAK RABIN, PRINCESS DIANA, PRINCESS KATAHMI, QUINCY JONES, RABBI M M SCHNEERSON (The Lubavitcher Rebbe), RABBI SHMULEY BOTEACH, RAY CHARLES, REPLACED BY A 4000 YEAR OLD EGYPTIAN SPOON AND A SIXTEENTH CENTURY PEWTER SPOON FROM THE TUDOR AND STUART DYNASTIES), REX HARRISON, RICARDO MONTALBAN, RICARDO ROSETT, RICHARD BACH, RICHARD BRANSON, RIDLEY SCOTT, ROBERT ALTMAN, ROBERT BOLT, ROBERT DOWNEY JNR, ROBIN GIBB, ROCK HUDSON, ROY COHN, RUDI VÖLLER, SADAM HUSSAIN, SALVADOR DALI, SARAH MILES, SASAKAWA RYOICHI, SEAN CONNERY, SENATOR CLAIBORNE PELL, SHAGGY, SHIRLEY MACLAINE, SHOSHANA DAMARI, SIGMUND FREUD, SIR WINSTON CHURCHILL, SLASH, SMAP SMAP, SOPHIA LOREN, SPICE GIRLS, STEFAN RAAB, STING, TERENCE STAMP, TERRY WOGAN, THE DUCHESS OF YORK, THE DUKE & DUCHESS OF WINDSOR, THEODOR HERZL, THEODORE (TEDDY) KOLLEK, THOMAS GOTTSCHALK, TONY CURTIS, UNGARO, VICE PRESIDENT ALBERT GORE, WALTER CRONKITE, WERNHER VON BRAUN, WIM THOELKE, WHITNEY HOUSTON, WHOOPI GOLDBERG, WILLY BRANDT, YAFA YARKONI, YASSER ARAFAT, LIU YANDONG (Vice Premier of the People’s Republic of China. 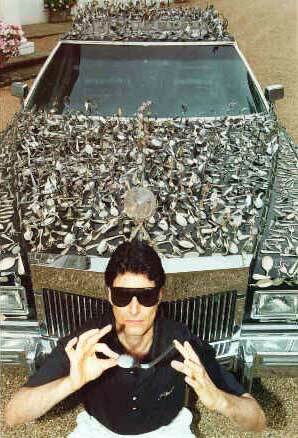 ), A 700 YEAR OLD TIBETAN SPOON (stolen from the car while in a museum).